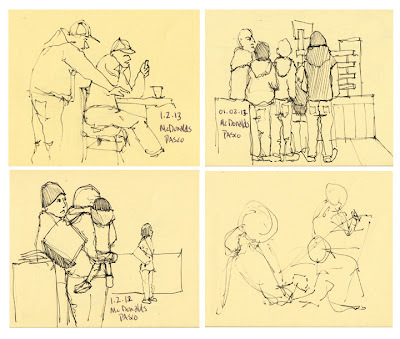 Our first Wednesday Morning Sketchabout of 2013 was held this morning at the McDonald's on Road 68 in Pasco, WA. It was nice getting back together with Jean, Nancy, and Dave for this session. The holidays are nice, but once one is addicted to sketching with friends, it's nice to return to the fray. We had a great time visiting and sharing art and life together and I can't wait until next Weds until we do do something similar again. I was surprised to find as many folks in McD this early in the morning (we started at 9am). At first it was mainly older, retired folks enjoying a morning coffee; then as time went by, a younger crowd started coming in. 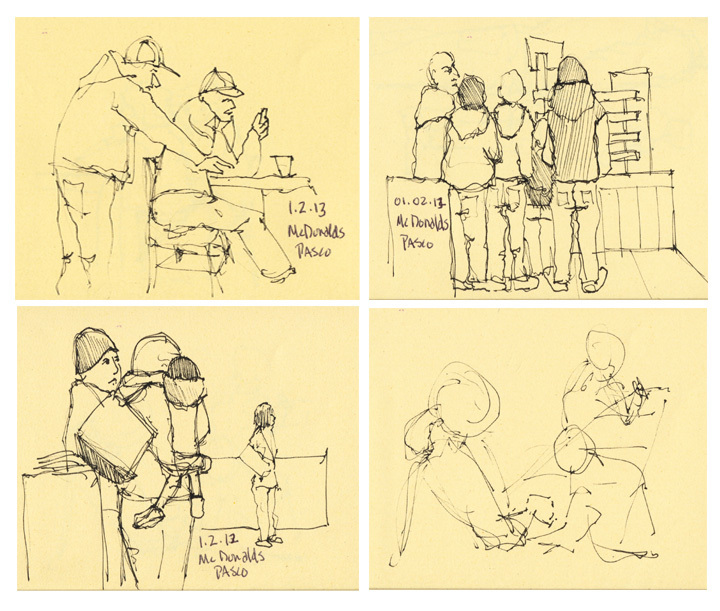 My vantage point was a good one, as I was able to sit back in my chair, look down the line of people waiting, and in a somewhat unhindered manner sketch without detection. This might be a place to go back to sometime. We have decided to schedule our sketchabouts for every Weds morning of each month into the far and distant future, unless something else comes up, of course. We will also continue with our Third Saturday Sketchabouts for anyone who can't make the Weds sessions. Click here to view our blog. And click here to find us on FB. Remember, anyone with something to draw with and on is welcome to join us. There are no fees and we love doing this. Nice group of sketches Jim. I like the narrative they suggest.